As heavy pressure builds on Islamabad, Kashmir heats up. Early Sunday morning, militants attacked an Indian Brigade headquarters in Indian administered Kashmir, in the town of Uri. The attack left 17 dead as fires swept through the camp. The attack is one of the deadliest in decades. In a pre-dawn raid, militants stormed the military post located close to the Line of Control with Pakistan, brandishing guns and grenades. 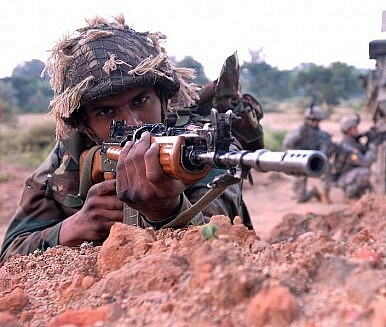 All four attackers were killed and 17 Indian soldiers lost their lives. Twelve of the soldiers were killed when grenades lit their tents on fire. Indian Home Affairs Minister Rajnath Singh referred to Pakistan as a “terrorist state” following the attack. “I am deeply disappointed with Pakistan’s continued and direct support to terrorism and terrorist groups,” the minister said. “We salute all those martyred in Uri. Their service to the nation will always be remembered. My thoughts are with the bereaved families,” the prime minister said. The juxtaposition of the attack in Kashmir and Pakistani Prime Minister Nawaz Sharif’s visit to address the UN General Assembly next week is interesting to say the least. Sharif left for New York on Friday, where he will call on the international community to live up to their promise of self-determination for Kashmir. The attack also comes at the heels of increasing international pressure on Islamabad over its continued support of terrorist and proxy agents in Afghanistan. The United States recently concluded high level meetings between U.S. Secretary of State John Kerry and Narendra Modi regarding strategic economic ties between the two countries as the United States shifts toward India. Moreover, Washington has been spearheading Afghanistan’s pivot to India in an attempt to build greater defense and economic ties. Afghan President Ashraf Ghani just concluded a two day visit to India, where he shored up bilateral economic and security arraignments. Following the G20 summit in Hangzhou, China, a Chinese state run newspaper published an editorial warning Pakistan over potential delays and shifts in the China-Pakistan Economic Corridor (CPEC), citing security concerns. Furthermore, IHS Jane’s 360 reported last night that it appears Pakistan is constructing a new uranium enrichment facility at the Khan Research Laboratories (KRL), a known centrifuge facility. It is unknown whether or not recent international pressure and the discovery of the new uranium enrichment facility is connected to the attack in Kashmir; however, Sharif’s speech before the UN allows Pakistan to change the subject and focus heat on India. Tensions have been flaring in Kashmir this summer since the death of prominent rebel leader Burhan Wani, the leader of Indian Kashmir’s largest rebel group, the Hizbul Mujahideen. At least 87 civilians have been killed in clashes with Indian forces in the volatile region since Wani’s death. Kashmir has been the focal point of three wars between Pakistan and India since independence in 1947, the 1947 and 1965 Indo-Pakistan wars and the Kargil war, fought between May and July of 1999. India claims the entire states of Jammu and Kashmir, which is contested by Pakistan. Numerous rebel groups operate in the region with varying political allegiances, from wanting outright independence and autonomy to a broader merger with Pakistan. Those groups include Hizbul Mujahideen, the Jammu and Kashmir Liberation Front, which seeks independence for Kashmir, and Pakistan-based Lashkar-e-Taiba – a terrorist group with connections to Islamabad and the 2008 Mumbai attacks. The attack in Kashmir appears opportunely timed as Islamabad faces international scorn and condemnation over its support of proxy groups in the region; the attack also provides Nawaz Sharif with political fodder to lay the blame at India’s feet for its mistreatment of Kashmiri citizens before the UN General Assembly next week.